But that was yesterday, the past has vanished and the water has ran quickly under the bridge. We have left behind this above scenery, maybe not for greener ones as they say, but for "different" ones. We have left behind so many good people, so many new friends, that it has been impossible to say our good byes to all. You have been kind with open arms, inviting in your town this traveler and his dog with no demands and much respect. We are so thankful to you all, please be assured that a somber moment will not spoil the joys and happiness felt these past months! 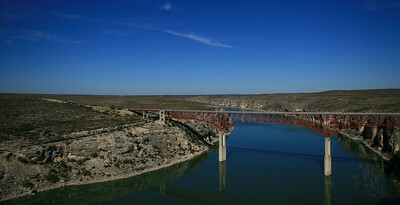 We are near Del Rio tonight, by the Amistad reservoir, as I remember passing by about a year ago without stopping. Never thought we would backtrack in this fashion, but, we need to be in Atlanta on January 22nd, and as we travel slow, maybe a bit of good food in Louisiana might be also on the horizon. Seeing some good old friends? That is for sure also! 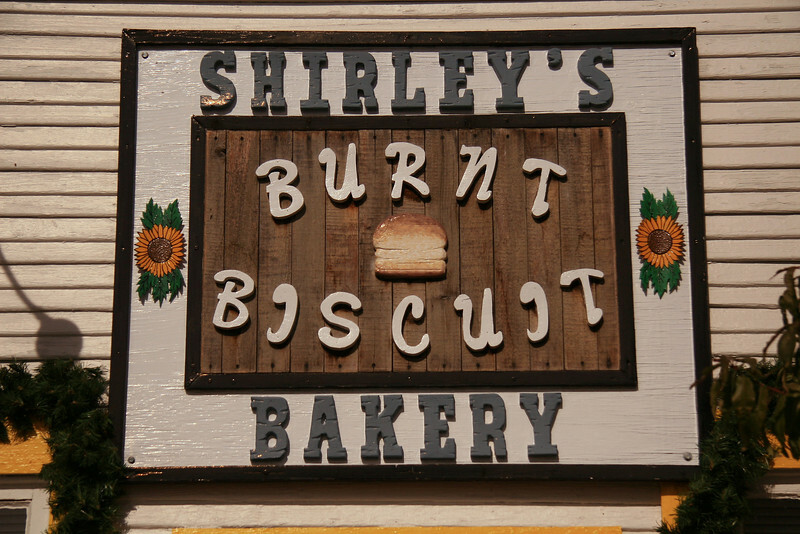 You remember "Shirley’s Burnt Biscuit" bakery in Marathon? It was closed the last time we visited the town… OPEN today and Spirit just had to stop to check it out! I had joked a bit writing that the name was a safe name… just in case. Well, they do not deserve such punishment from me as their baked good are outstanding. I still have some here, yes, had to buy some to go, and the pictures will be up next time! 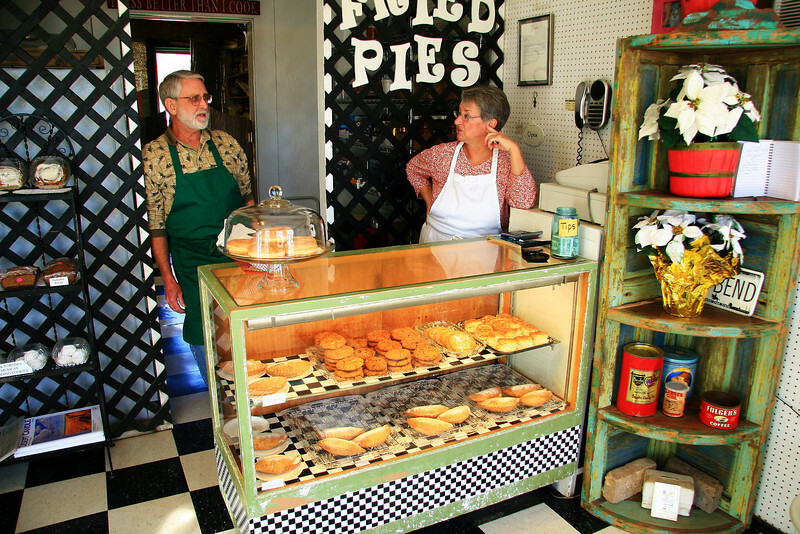 Nice flaky and fluffy biscuits, the best fried pies you will ever have (they where in the middle of shipping some to Sacramento, CA) and I even had a chocolate covered glazed donut! I paid the price, but the taste buds did appreciate the treat! Shirley has retired now, Dan baked with her for a year and a half and now runs the shop. Coincidence?… this was the same lady below that also works at the bookstore who bought a card of Spirit from us and chatted just about all afternoon. I am so sorry I forgot her name. Now you understand why we travel so slow! we are lucky to be here tonight. If you are wondering why you are not seeing any chocolate covered donuts… I was not lying! I had the last one… Back on the road, full, happy and satisfied. Both of us… always a treat for Spirit… he cannot be left out. His look while I eat is enough for me to reach for one lately always stuck in my pockets… one benefit about baking and selling our Doggie Treats! So we went on, admiring the scenery. I was told once that the ride would be boring, but truly, nothing really bores me as there is a lot to see and notice. The layers and colors of the rocks when the roads where built cutting right through them, the vegetation changing to different colors and shapes, nothing is ever the same, as it was when living on a sailboat when others asked me if I ever got bored looking at the same water every day. It is never alike the minute before! 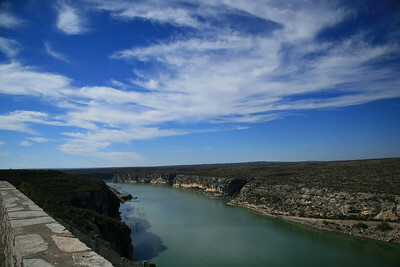 We are about 8 miles from Del Rio, and the reservoir itself only a few feet from us. Obviously the dish is up, the generator is running, we are back after much luxury of power and water in a primitive campground, $4 a night, and here I thought that Texas did not have such camping! No water, no power here, but a great view of the water and Spirit has already spotted some giant rabbits! There is a Blog reader near by. Mary Jo, she is also traveling with her Pit Bull "Molly" and they will meet formally tomorrow. We are planning to go into the town of Acuna, Mexico, to check it out, maybe have some lunch… I was told that it is a pretty colorful town. You will be the first ones to know. 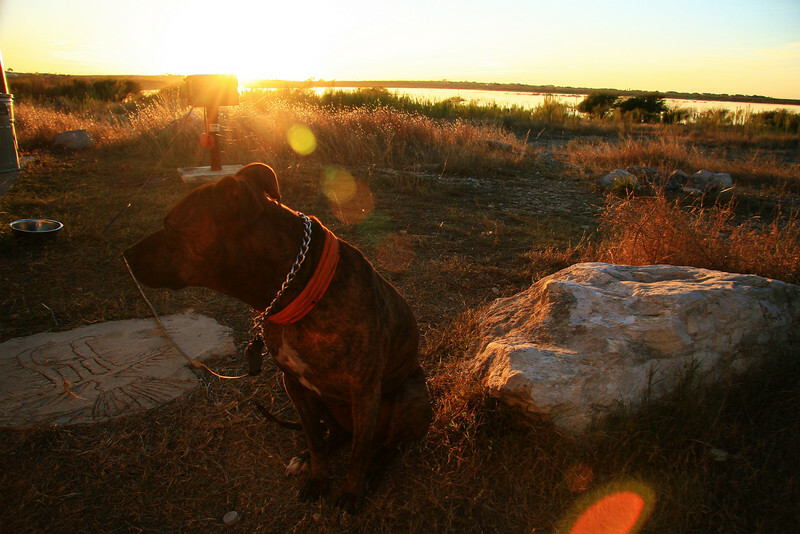 This entry was posted on Tuesday, December 18th, 2007 at 7:59 pm	and is filed under travel, spirituality, pit bull, sidecar, motorcycle, cooking, photography, riding, homeless. You can follow any responses to this entry through the RSS 2.0 feed. You can leave a response, or trackback from your own site. As I read your post today I was reminded of something I just read yesterday by Joseph Campbell. It spoke to me because of some things that have happened in my life recently. Nietzsche was the one who did the job for me. At a certain moment in his life, the idea came to him of what he called “the love of your fate” (Amor fati). Whatever your fate is, whatever the hell happens, you say, “This is what I need.” It may look like a wreck, but go at it as though it were an opportunity, a challenge. If you bring love to that moment—not discouragement—you will find the strength is there. Any disaster that you can survive is an improvement in your character, your stature, and your life. What a privilege! This is when the spontaneity of your own nature will have a chance to flow. Then, when looking back at your life, you will see that the moments which seemed to be great failures followed by wreckage were the incidents that shaped the life you have now. You’ll see that this is really true. Nothing can happen to you that is not positive. Even though it looks and feels at the moment like a negative crisis, it is not. The crisis throws you back, and when you are required to exhibit strength, it comes. Settling down is such a loaded term, and i never thought I would, but when the time came I was aware of it and in settling down I found I was happy. My wife and I both agree that if either of us feels the need to move on we will do so. I used to be happy spending hours watching waves slip under my boat. Now I like the challenge of a job and dealing with dispirited, hidebound colleagues. I am so much better armed than they for the bitter nonsense of day to day living. Oh and don’t expect to be a local anywhere when you live by your wits in a sidecar. To be local you must appear to live as the locals do. Their game their rules! Good luck with the frost. Check out the southernmost beach in Bell Isle Louisiana- probably blown away by Katrina. 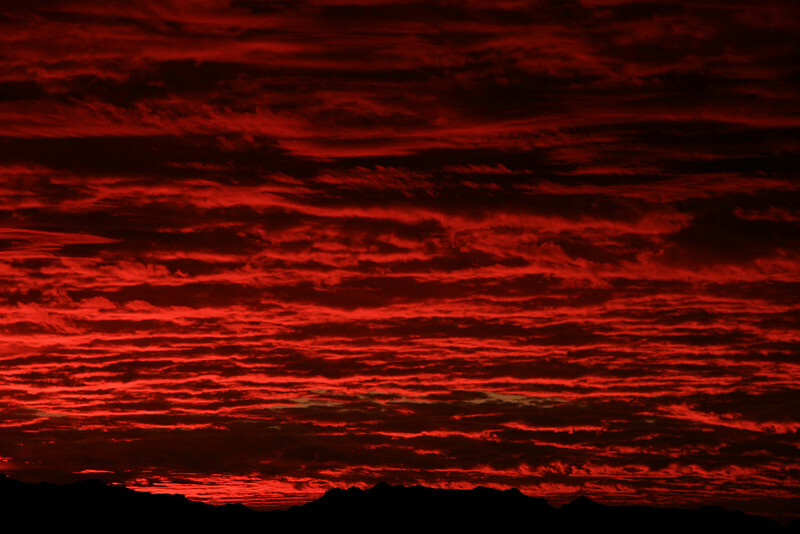 Oh how I will miss your posts from Big Bend. You supplied me with many a joyful, but wistful evening viewing your fantastic photos and touching stories. I know there are more to come while you travel, but the Big Bend area has stolen my heart forever. I was so dismayed to read about the Art Show snub. 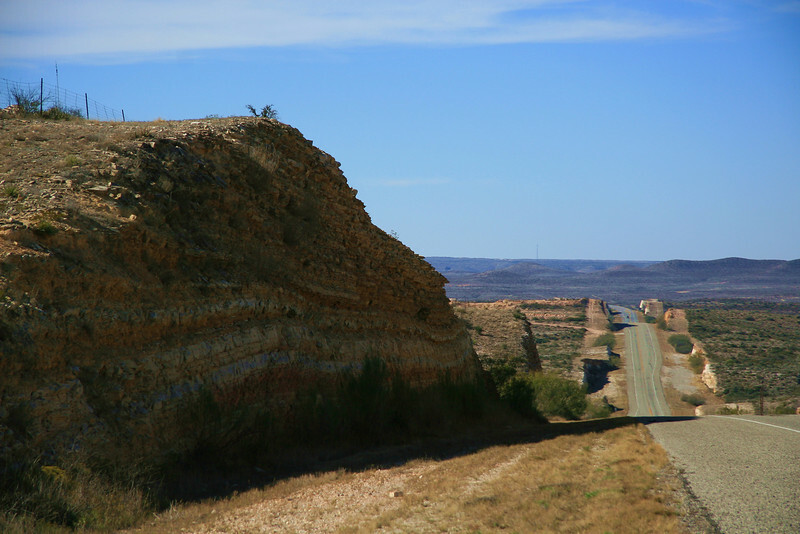 I had pictured Terlingua folk as different from the rest of the mortal shuffle, but seems rudeness and meanness can still flourish even in places as special as the Bend. Very, very disappointing. I know we shouldn’t let a few bad apples spoil the barrel, but it is hard not to feel let down. Here’s wishing you and Spirit safe travels, and happy trails ahead. Merry Christmas Ara & Spirit.